The way insurance adjusters traditionally have evaluated roof damage after a hurricane is nearly as dangerous as it was slow. Property adjusters would use a ladder to climb on top of a damaged roof, and painstakingly assess the damage while hoping they weren’t injured in the process. U.S. property adjusters have an injury rate nearly four times greater than that of a typical construction worker. Once on top of the building, the adjuster would use a handful of tools — a camera or smartphone to document the damage, a tape measure to measure a test area and perhaps chalk to outline it. Once an adjuster had calculated the extent of the damage in a given area, he or she can extrapolate the arrive at an estimate of damage for the entire property, and then drive to the next property on their list to start the process over again. 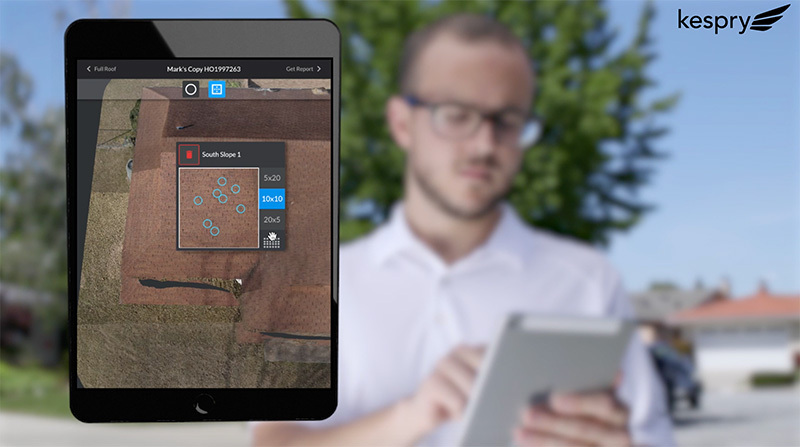 Now imagine using a drone to survey damage from a number of homes consecutively. The entire process can be automated and performed in a fraction of the time, said George Mathew, chairman and chief executive officer of Kespry, which hails itself as an aerial intelligence company. “You punch in on an iPad the coordinate area you want by creating a polygon around the property, and then select the area you want to inspect and collect the data that’s needed,” said Mathew, whose firm has been refining drone-based insurance adjustment for hurricane damage. Last year, the CEO of Farmers Insurance reported the drone-based technique helped them compress the process for assessing hurricane-damage claims from three homes per day to three homes per hour. “That is almost an eight to 10 times productivity improvement,” Mathew said in an interview at Dreamforce. In addition, the approach is more accurate because drones can accurately measure the dimensions of the roof. The technique also supports the use of artificial intelligence algorithms to identify anomalies where hail strikes have occurred and input the information directly into insurers’ claim management and claims processing software. The company can also infer where wind-induced roof damage. While Kespry is building its expertise in the insurance sector and is working with both State Farm and Farmers Insurance, its first focus was on the industrial sector. “We had a mindset when we were founded in 2013 that the drone was a source of sensor-based data capture that we should be able to automate,” Mathew explained. The company first targeted using drones in mining to measure volumetric stockpiles and inventory. “We could fly a drone overhead, process the imagery that’s coming off the drone and convert that from a 2D set of high-resolution images into a three-dimensional model using photogrammetry,” Mathew said. The technique was considerably more accurate than the traditional method of measuring stockpiles, which had a variance per stockpile of anywhere from 15 to 20 percent. Kespry claims it can estimate the amount with an accuracy of 1 to 2 percent. The same technique can be used to measure materials at construction sites. “Our thinking around the measurement of heavier industrial assets was that image-based processing and computer vision was a completely new realm of capability that was underleveraged in the industrial sector,” Mathew said. While industrial applications of AI, machine learning and computer vision have been discussed for decades, the technology largely has been deployed for select use cases. And while large tech companies such as Amazon, Google, FedEx and Uber have experimented with using drones, they are mostly targeting ambitious use cases with uncertain commercialization timelines and often more tenuous regulatory considerations. While in the early phase following a hurricane there are flight restrictions that prevent drones from flying in damaged areas to avoid collisions with rescue helicopters, once that period is completed, the airspace opens back up and drones can begin flying. In 2017, Claims Journal reported a significant shift toward using drones in Texas to assess the damage from Hurricane Harvey. But in the industrial and insurance sectors, the combination of machine learning technology and computer vision can be deployed for important use cases now. “We keep going after these industrial use cases where artificial intelligence, machine learning on physical assets using kind of a lever of machine learning and computer vision is really helping make better automated decision in these industrial enterprises,” Mathew said. When asked if the same technique could be deployed to assess damage in other disasters, Mathew said: “ It gets a little trickier with things like fires and tornados because it’s often a total loss, right?” But even in some cases like this, drones can be used to measure hollowed out foundations to make the assessment of what the total replacement value for the home or building would be based on the dimensional analysis of the foundation. In the future, the functionality the technology offers could steadily improve as AI technology advances for targeted use cases. “I think there is this overinflation of the term AI and what it means. I think general AI is way into the future, but specific AI where you applying algorithmic methods for better decision making is becoming more convincing and relevant,” Mathew said.